Although the truly “unpiggable” pipeline is rare in today’s age of advanced ILI technology, a number of challenging-to-inspect pipelines do exist. When these pipelines require in-line inspection, it is important that the chosen inspection method be able to both successfully navigate the full length of the line, as well as collect accurate and high quality inspection data. Quest Integrity was approached by a pipeline operator to inspect a 16x20 inch pipeline that had been previously considered unpiggable, and had never been inspected using smart pig in-line technology. The challenges for this particular pipeline were numerous. When a pipeline has significant diameter transitions, traditional in-line inspection technologies can have difficulty navigating through these transitions and making accurate measurements. When the pipe diameter changes, most tool technologies do not have the capability to adequately expand or collapse to allow consistent tool flow and accurate data collection. Another significant challenge for the operator was the pipeline’s location in a populous area. Due to the high cost for remediation digs in that area, the operator was faced with either decommissioning the line, or finding an in-line inspection technique that was capable of successfully determining the line’s fitness-for-service. By custom creating a tool specifically built for this particular pipeline’s needs, the operator was able to effectively inspect the pipeline on the first inspection run, avoiding the premature decommission of the pipeline. Prior to the ILI, Quest Integrity assisted the operator in cleaning the line and preparing it for inspection. The line was flushed of its original product (wet gas), and free-flowing cleaning pigs were run through the line in water, effectively clearing the pipeline of debris. By using water as the cleaning medium and inspection couplant, the operator was able to receive a consistent clean of the pipeline, as well as complete and accurate inspection coverage. Once the pipeline cleaning efforts were executed, the custom in-line inspection tool was run through the line, and successfully collected high resolution data on 100% of the pipeline’s internal and external surfaces. Once the inspection was completed, Quest Integrity assisted the operator with rapidly drying the line down to the required dew point so that it could be quickly returned to service. The results of the inspection identified a number of areas that would require remediation and repair (see Figure 1). During a previous remediation dig, the operator visually identified areas of corrosion on the exterior of the pipeline surface. However, the high cost to continue digging to attempt to visually locate the full extent of damage made these remediation efforts too costly, and largely ineffective. By performing an ultrasonic in-line inspection, the operator was able to both identify and locate areas of potential damage, as well as measure the exact wall thickness throughout the entire length of the line. For this particular line, the greatest benefit of receiving this quantifiable inspection data was the ability to pinpoint the exact location of degradation, effectively eliminating the need for costly digs to locate unverified damage mechanisms. Figure 1. 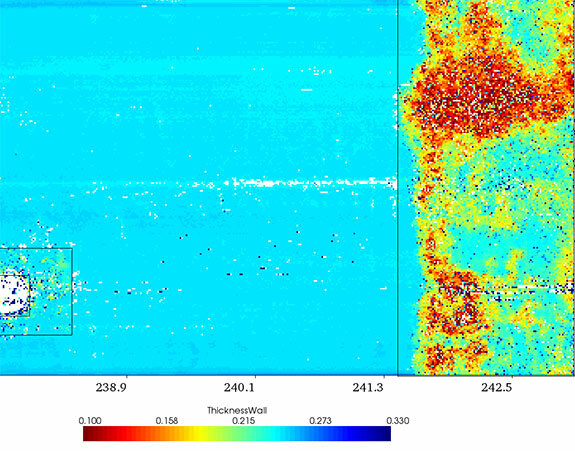 Inspection data identifying metal loss on pipeline surface. In the past, unpiggable pipelines have had limited options for accurate inspection. However, operators now have the luxury of accessible custom tool development, specifically designed to address their pipeline’s individual and unique needs. In the case of this historically unpiggable 16x20 in. pipeline, the operator achieved substantial cost savings by successfully navigating and collecting high-resolution ultrasonic data throughout the entire length of the pipeline. By avoiding early retirement of the line, the operator likely saved many millions of dollars, and received the peace of mind that their asset was fit for continued operation, effectively and safely.